William Farquhar Payson, author, editor, novelist, playwright, entrepreneur, promoter, business man, salesman, publisher, was responsible for publishing one book Frank Lloyd Wright was involved with and another that he wrote. He was born in New York City on February 18, 1876, the son of Francis and Mary Farquhar (Dabney) Payson. He studied at Columbia University, 1892�1893, but left to become a reporter at the New York Times from 1893-1895. He moved on to managing editor of Vogue from 1895�1897 at the age of nineteen. He then became editor of Clips magazine from 1897-1899. He was married to Mary Farquhar King on October 27, 1897. 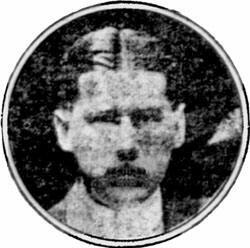 He wrote a short story at the age of nineteen, "A Large Reward", which was published in Frank Leslie's Popular Monthly. He then successfully published his first novel "The Copymaker", in 1897 at the age of 21. From 1909-1913, he was Vice President and literary adviser for the Sturgis & Walton Company, publishers. He looked after the London interests of the firm, places their books and secures English books for the American market. He took numerous trips to Great Britain. From 1914 to the early 1920s, borrowing from the mythical gods, he formed the Atlas Advertising Agency. All located at 450 Fourth Ave. in New York, he was President and Director of the Atlas Advertising Agency and the Atlas Selling Agency, and Vice President of the Curtiss Special Agency. Of note is that John Curtiss was President of the Curtiss Special Agency and V.P. of the other two. In April, 1920 it was announced that Curtiss was withdrawing from Atlas to form the John Curtiss Co., at a different location. Whether due to his success as an advertising executive or from book royalties, he hired architect Howard Greenley in 1918 to design a rather large, magnificent home just west of the Long Island Sound shores, near Darien, Conn. 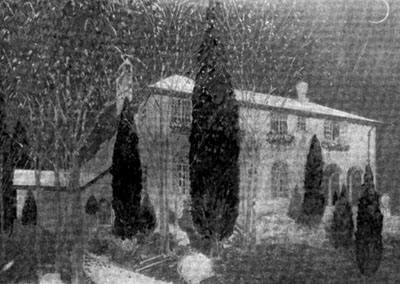 The home was featured in the January 1918 issue of Concrete Magazine and the August 1919 issue Architectural Forum. During the early 1920s he became the business manager of "Success Magazine". William Farquhar Payson, circa 1915. "He is a tall slender, brown-eyed gentleman, with a triangular mustache, a winning smile and a modest reluctance to lay down the law on any subject. But he has studied American social phenomena and he has drawn conclusions." Interview after his latest novel "Love Letters of a Divorced Couple". Courtesy Pittsburgh Post Gazette, The Press Publishing Co. It is unclear when he divorced his wife, but it could have been his own experience he used in 1915 when he wrote "Love Letters of a Divorced Couple". On August 27, 1927 he married Clare Moores, a former actress and Broadway star. In 1930 he announced his intentions of re-entering the publishing business, incorporated "William Farquhar Payson, Inc.", and published a number of books until 1934 including "The Disappearing City". The stock market crashed in October 1929. By 1934 the depression was at its height. So was Bonnie & Clyde (1932-34). In December 1934 it was announced that the Payton list of books would be manufactured and distributed, with his active cooperation, by the Georgia Press. When he wrote his final book in 1935, it was published by Dodd, Mead & Company. His obituary was published in the New York Times. He passed away on April 15, 1939 at the age of 63, after struggling with his health for three years. It begs the question, could the demise of William Farquhar Payson, Inc., and the stress brought on by the loss of business brought about the decline in his health, and eventually his death? How is the life of one man summed up. His passion for writing was obvious. Managing editor of Vogue Magazine by the age of nineteen. Successful novelist by the age of 21. Writer of Broadway plays. His novels on the silver screen. A magnificent home gracing the pages of Architectural Forum in his early forties. By any measure he was wildly successful. He succeeded in every endeavor. But it seems that he did not survive the great depression. Business and health failure seems to have taken its final toll. "A Large Reward" (short story), Sept. 1895; Published in Frank Leslie's Popular Monthly, pages 865-369. "The Children of the Sun" (ss), Published in The English Illustrated Magazine, July, 1900, pages 379-384. "The Point of Issue" (ss), 1901; Published in Harper's Monthly, April, 1901. Illustrated by Lucius Hitchcock. "The Triumph of Life" (n), 1903. "Debonnaire" (n), 1904; Published in Ainslee's Magazine, May 1904. This book was produced as a four-act comedy, collaborating with James MacArthur and played throughout the US during 1905-06. Paul Gilmore starred in the title role. The Motion Picture Studio Directory of 1921 included an announcement that Selig and Rork were in preparation to produce "Debonnaire" as a full length movie. "Barry Gordon" (n), 1908; Published in Munsey's Magazine, Feb-Aug (7) 1908. In 1921 this book was made into a full feature silent B&W movie, "Cheated Hearts", starring Boris Karloff as Nei Hamid. Directed by Hobart Henley, Herbert Rawlinson played the main character Barry Gordon. Kirkwood. Mary Miles Minter played the main character Periwinkle. "War Advertising Will Affect Peace Advertising", (Article), Published in Printer's Ink, October 17, 1918, page 56. "Love Letters of a Divorced Couple" (n), 1915; Published in Blue Book Magazine, February-August (7) 1908. "The Joker" (play), 1925. An original four-act play, co-authored with Arthur F. Goodrich, opening at Maxine Elliott's Theater in New York on November 16, 1925. "Mahogany, Antique and Modern; a Study of its History and Use in the Decorative Arts", 1926, edited by Payson. "Candles in the Sky" (play), 1931. A four-act play produced by William A Brady, Jr., at Savoy Theater in Asbury Park, NJ. "Give Me Tomorrow" (n), 1935. This novel was dramatized in a three act play by Rita Weiman and Maurice Marks in 1936. William Farquhar Payson was not a stranger to architecture and architects. In 1918 he hired architect Howard Greenley to design his home overlooking the Long Island Sound, near Darien, Conn. Constructed of concrete walls, his home was featured in the January 1918 issue of Concrete Magazine and the August 1919 issue Architectural Forum. In 1926 Payson edited the volume "Mahogany, Antique and Modern; a Study of its History and Use in the Decorative Arts", which not only included the decorative arts, but also a chapter on "Mahogany in architecture". In 1928 while at Payson & Clarke he published "New Dimensions", Frankle, which was dedicated to, and included a foreward by, Frank Lloyd Wright. He also published Le Corbusier's "Toward a new Architecture" in 1928. In 1929 he published a second book by Le Corbusier, "The City of To-morrow and its Planning" and Henry Russell Hitchcock's "Modern Architecture". 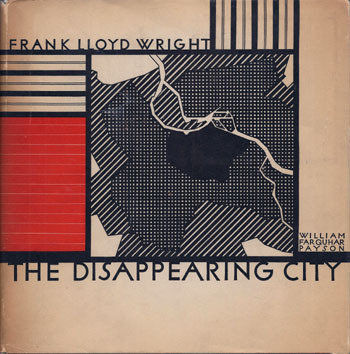 So it would not be out of order for Payson to publish a book by Frank Lloyd Wright entitled "The Disappearing City". On February 6, 1932, Payson wrote to Mr. Wright. "I have read the first 15,000 words of �The Disappearing City� with tremendous interest. I am all for it. To me it is intensely stimulating and I am now eagerly awaiting the latter part with your constructive suggestions as to Broadacre City." W.F. Payson's Concrete House, Howard Greenley, Architect. From a color drawing of the architect's conception of the finished work. Courtesy Concrete Magazine, January 1918. On November 17, 1931 Frank Lloyd Wright signed a contract with William Farquhar Payson, to publish "The Disappearing City". Wright would deliver 40,000 words by February, 1932. The retail cost was $2.50. Wright was to supply six photographic prints. He received an advance payment of $500. On February 6, 1932, Payson wrote, "I have read the first 15,000 words of 'The Disappearing City' with tremendous interest. I am all for it. To me it is intensely stimulating and I am now eagerly awaiting the latter part with your constructive suggestions as to Broadacre City..."
A month later Payson indicates financial problems, he has joined forces with Holborn House publishers and plans "publishing your book under this imprint with your approval". He does not indicate why, but those plans were changed. "I plan to publish the book under my own personal imprint as originally intended. I have entirely withdrawn from Holborn House... The jacket design and the sample book arrived this morning. I will have �Holborn House� taken off the drawing..."
On May 25, 1932, six months after signing the contract, the "finally considered and corrected manuscript" was delivered. The manuscript and dust jacket design were complete, but the six photographic prints were still lacking, "cannot move without the illustrated material..." It would take another two months to agree on the photographs. Wright suggested including drawings of his work, while Payson was inclined to keep it more philosophical. "I feel, too, that although the architectural photographs are intensely interesting it somehow limits the scope of the book if we use so few. Your text matter and the illustrations we have are so stimulating to the imagination in a broad way that it seems to me a mistake to get down to cases." On July 20, 1932, Wright provided the text for the front and back flaps of the dust jacket. "As visualized by a great architect, in this book the reader may find the ideas destined to remodel any civilization on the basis of an intelligent use of the machine..."
Release was slated for September 8th. Wright requested 100 copies of the book. "I am quite proud of my publishers achievement. The little book is attractive - good style... Here�s hoping there is a sale for it equal to your expectations." In a statement of the account from 9/8/32 to 4/1/33, 566 copies had been sold, earning $140.80 in royalties. The cost of Wright's alterations were $43.05. Wright's advance was $500 leaving an unearned balance $402.25. Nothing was mentioned about the 100 copies Wright requested on September 8, 1932. At a 10% royalty, Payson must have anticipated selling 2,000 copies to cover Wright's advance. There is no indication how many books were sold over the next twelve months, but on March 20, 1934 Wright wrote to Payson and offered to take over the "The Disappearing City". Payson wrote back and indicated that he had 183 bound copies (finished books with covers), 1,000 sewed sheets (books without covers), 1,000 jackets (dust jackets) as well as a full set of electros cuts, bindings and dyes and would sell the lot for $700 and cancel the contract. Wright responded by suggesting that Payton keep 83 copies, send everything else, and offered $650, Payson accepted. The packing slip for Case 2 (packing slip for case one not included), indicated that there were 308 sewed books, and 1,240 dust jackets. Case one most likely contained the balance of 692 sewed books. The original terms of the sale were C.O.D. The funds Wright had counted on to pay for the books fell through. "...we learned to our chagrin when the book arrived that the gentleman, Goldsmith by name, could have been more appropriately named. He failed to produce the money..." ("At Taliesin", Henning, p34, reported that David Goldsmith, a Chicago businessman [and wannabe business partner] was a visitor to Spring Green on April 6, 1934. He "spoke of past experiences and future aspirations".) With Goldsmith leading him on, month after month, then leaving him high and dry, it left Wright without the funds to pay for the books. Wright apologized and contacted others for help. The crates sat at the station and were "piling up demurrage charges at an alarming rate". Wright agrees to sign a note for sixty to ninety days if Payson will release the books. Payson himself was in a bind, and wrote back, "Unfortunately, I cannot release the shipment to you as I am not privileged to do so. These items are basically controlled by my printers and binders under a working agreement I have with them which assures me of the necessary credit to carry on my business in these difficult times. It was only because of my representation to my printers and binders that I had received a cash offer from you of $650, that I was able to make the shipment and take the plates, etc., etc., out of their hands..."
Payson's attitude seems to have changed from the once self assured man who succeeded at everything he did, one who was in control of his own life, to one being controlled by others. In better times he probably would have relented. Without funds, Wright is in a dilemma. He telegrams Payson that he will be forces to return the books immediately unless he (Payson) can persuade the "timid printers" to release the books for sixty days pending outcome of negotiations. He will not "touch books unless deal goes through..." The "extended storage charges are prohibitive." Payson agrees, the note is received and the shipment is released. Wright fails to raise the funds to pay off the note, so sends a second note that extends the first by 60 days, "We are doing our best to realize enough by book and hook or crook to �pay up�. Pray for us." Payson's patience has been stretched to its limits. He returns the note. "The note which you have given me in the sum of $650. and which was presented for payment, and dishonored, cannot be renewed..." Note was transferred to American Book Bindery, Inc. The last page of correspondence was from their attorneys, and "...unless payment... is made by return mail, we are to institute proceedings against you..." They gave Wright until August 7th, 1934. All quotes are copyright of the Frank Lloyd Wright Foundation. Versions of "The Disappearing City"
There are two versions of "The Disappearing City". The change occurs only on the covers. The two covers were most likely a result of events caused by the Great Depression, not the printing of a second edition. The contract was signed on November 17, 1931 between Frank Lloyd Wright and William Farquhar Payson, who may have anticipated the sale of at least 2,000 copies, and guaranteed Wright an advance of $500. The retail price was set at $2.50, with Wright receiving a royalty of 10%. At that rate, the sale of 2,000 copies would yield $500. But printing 2,000 copies is only speculation. After successfully publishing books for eight years, Payson would have an understanding of the publishing business. In anticipation of possibly selling 2,000 copies it would seem a reasonable assumption that he would print 2,000. By piecing together sketchy records it appears that he did not bind the total amount, possibly an attempt to conserve funds. In Payson's correspondence with Wright on March 27, 1934, he still had 1,000 sewed sheets and 1,000 dust jackets on hand. In the sixth month statement dated April 1, 1933, 566 copies had been sold. Nothing was mentioned about the 100 copies Wright requested on September 8, 1932. There is no further indication as to how many books were sold over the next twelve months, but on March 20, 1934 Wright wrote to Payson and offered to take over the "The Disappearing City". Payson wrote back and indicated that he had 183 bound copies (finished books with covers), 1,000 sewed sheets (books without covers), 1,000 jackets (dust jackets). If the assumption is a run of 2,000, and only 1,000 were bound with covers, that would leave 251 sold copies (1,000 - 566 - 183 = 251). If the bulk (566) would have been sold the first six months, it is feasible that 251 could have been sold over the next 12 months. Blue Cover. It seems most logical that this version was produced by Payson. His name is on the dust jacket, he printed the dust jackets, and jackets have only appeared with the blue version. Blue cloth boards include a small label attached to the front board. The label is a smaller version of the illustration on the dust jacket. There is no text on either the front or spine. The two-color dust jacket was designed by Frank Lloyd Wright and covered the front and back. It included the publisher's name, William Farquhar Payson, on the far right. The paper label affixed to the blue cloth cover lacked the publisher's name and was reduced to one color, black. As to why there was a label attached to the cover, one can only speculate. Was it Payson's attempt at creativity? Wright supplied the text for the front and back flaps. Green Cover. When Wright acquired the unsold copies of "The Disappearing City", it included 1,000 sewed sheets (books without covers), 1,000 dust jackets as well as a full set of electros cuts, bindings and dyes. In Payson's response of March 27, 1934, he indicated that it would cost $170 to bind the final 1,000 books. Wright declined the $170 offer opting to purchase the unbound copies. If Wright produced the covers, there is no indication as to why Wright chose to change the binding for the remaining 1,000 sewed sheets, or why the remaining dust jackets were not used. Faced with a debt of $650, the choice may have come down to cost. He used only the black plate, removed Payson's name and printed the ink on green cloth boards. There is no record indicating how many of the remain 1,000 stitched copies were ever bound and sold. On May 15, 1934, Payson releases the 1,000 unbound copies of the book, accepting a 60 day note from Wright. Unable to come up with the funds Wright sent a second note to Payson on July 17. "Enclosed is 60 day note to replace the first one given. We are doing our best to realize enough by book and hook or crook to �pay up�. Pray for us." This would seem to indicate that Wright was attempting to raise the funds by selling copies of the book. If that were true, he would have had to bind copies to sell them. He only had 100 copies of the original binding, and if he sold them for $2.50 each, it would have netted only $250, not enough to pay Payson back. The second note was rejected, and on August 2, 1934 Wright received a letter from American Bookbindery's attorneys, "...unless payment... is made by return mail, we are to institute proceedings against you..." They gave Wright until August 7, 1934. It is not clear if Wright bound any copies of the green cover or how many. If Wright produced the green version, he had many opportunities to sell copies. A missed opportunity was "Taliesin I" which was mailed out around Christmas 1934 ("At Taliesin", Henning p. 71). 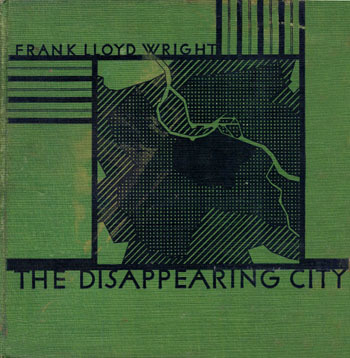 But Wright did not take the opportunity to mention any availability of "The Disappearing City". "The Disappearing City" introduced Broadacre City, Frank Lloyd Wright's concept for a decentralized community. He believed everyone should have at least an acre of land and the right to beautiful housing and carefully organized cities that were spread out, unlike the congestion of New York, a town he insulted more than once. Although "An Autobiography" sold well, "The Disappearing City" did not. Possibly being more theoretical in content, than practical examples, only 566 copies sold within the first six months. Wright felt a model of Broadacre might be more well received. With the financial backing of Edgar Kaufmann, Wright, with the help of his apprentices, set out to construct a 12' by 12' model of his concept. Broadacre was shown publically for the first time from April 15 to May 15, 1935 at the Industrial Arts Exposition in Rockefeller Center, New York, complete with tiny forests, homes, schools, factories and farms. It was next exhibited in the museum of the State Historical Library in Madison, Wisconsin. From there it went to Kaufmann's Department Store in Pittsburg, Kaufmann being Broadacre's benefactor. It next moved to Corcoran Gallery in Washington D.C., made possible by Mrs. Avery Coonley. It headed back to Taliesin then was displayed at the Mineral Point Iowa County Fair in September. 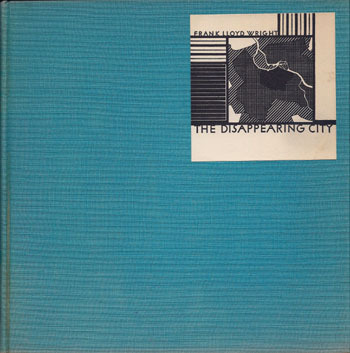 A logical opportunity would have been for Wright to sell copies of "The Disappearing City" at the Broadacre exhibitions. But what seemed logical never took place. Reviews in Architectural Record (April 1935), New Yorker (April 1935), American Architect (May 1935), New Masses (June 1935), Junior Red Cross Journal (February 1936), never mentioned "The Disappearing City". When Wright once again published "Taliesin I" in October 1940, devoting the publication to Broadacre City, "The Disappearing City" was listed as "Out of print" (p38). One can only speculate as to who produced the green cover and how many. Did Wright find the funds to produce a few hundred copies? Unable to pay the $650 debt, did Wright return the two cases of unbound books and covers, or what was left, to American Bookbindery, or was he able to pay of them off? What seems reasonable to conclude is that Payson most likely produced 2,000 copies, but only bound 1,000 in the blue covers. He sold 100 bound with blue covers to Wright, and 1,000 unbound copies and dust jackets. There is nothing conclusive to date as to how many were bound with green covers, or who bound them, but it most likely is the rarer of the two. Initially copyrighted by Payson, Wright acquired the copyright at the same time as the unsold copies, This enabled him to republish "The Disappearing City" in 1945 as "When Democracy Builds". In 1958, he expanded and rewrote his thesis as "The Living City". In 1969, Wright's marked up copy of "The Disappearing City" was published for the last time as "The Industrial Revolution Runs Away". Cover A was produced by Payson. Blue cloth boards with a small label on the front board. The label is a smaller version of the illustration on dust jacket. There is no text on either the front or spine. The two-color dust jacket designed by Wright covered the front and back. It included the publisher's name, William Farquhar Payson, on the far right. The paper label affixed to the cloth cover lacked the publisher's name and was reduced to one color, black. Wright supplied the text for the front and back flaps. Cover B was possibly produced by Wright. When Wright acquired the unsold copies of "The Disappearing City", it included 1,000 sewed sheets (books without covers), 1,000 dust jackets as well as a full set of electros cuts, bindings and dyes. There is no indication as to why the binding was changed for the remaining 1,000 sewed sheets. If it was Wright who produced the green covers, faced with a debt of $650, the choice would have come down to cost. He used only the black plate, removed Payson's name and printed the ink on green cloth boards. Text by Douglas M. Steiner, Copyright 2012. Wright and William Farquhar Payson are housed at the Getty Research Institute in Los Angeles, and copyrighted by The Frank Lloyd Wright Foundation. The following summarizes the correspondence between Frank Lloyd Wright (FLW), Karl E. Jensen (KEJ), Mr. Wright's secretary, William Farquhar Payson (WFP) and Edith Day Robinson (EDR), Mr. Payson's secretary. Nov. 17, 1931: Contract from William Farquhar Payson, Publisher. To Mr. Wright. Details of the contract were finalized. Will deliver 40,000 words by February, 1932. Retail cost $2.50. Royalty of 10% of retail price of copies up to 3,000 copies and 15% thereafter. Advance of $500. $125 upon signing contract, $125 weekly for three following weeks. Received six free copies. Wright was to supply six photographic prints, photographer would receive $25 for each. Signed by William Farquhar Payson, President. Accepted: Frank Lloyd Wright, Taliesin, Nov 19. Witness: K. E. Jensen. (Note: Hand written at the top of the first page, "This contract void. Replaced by contract of Dec. 22, 1931, accepted Dec 26th by Wright. KEJ." Nov. 28, 1931: From William Farquhar Payson (WFP). To Mr. Wright. Received signed contract and enclosing advance of $125. Dec. 15, 1931: From WFP. To Mr. Wright. Confirmation of the termination of the contract, parties are released from all obligations. Dec. 22, 1931: From WFP. To Mr. Wright. Copy of new contract, very similar to the Nov. 17, 1931, with minor changes. Not signed by Wright. Hand written note: "This completes advance payment of $500." Dec. 29, 1931: From WFP. To Mr. Wright. Appreciation of acceptance of contract letter. Enclosed personal check for $125. (Not Dated) From K. E. Jensen. To WFP. "Here are the first 1500 words ready for your criticism and suggestions..." Also enclosed are two phonographs. K.J. Feb. 6, 1932: From WFP. To Mr. Wright. "I have read the first 15,000 words of �The Disappearing City� with tremendous interest. I am all for it. To me it is intensely stimulating and I am now eagerly awaiting the latter part with your constructive suggestions as to Broadacre City..."
Feb. 23, 1932: From Karl E. Jensen (KEJ). To WFP. Request for sheets for preparation of manuscripts. Mar. 1, 1932: From WFP. To KEJ. "...we adhere in a general way to the Modified English form..." Signed William Farquhar Payson. Mar. 11, 1932: From WFP. Western Union: Request delivery date for manuscript photographs and biographic notes. "Have joined forces with Holborn House and plan publishing your book under this imprint with your approval." Mar. 18, 1932: From KEJ. To WFP. "...Mr. Wright has postponed the matter as there are several things he wants to talk over with you personally when he goes to New York in about 10 days..."
Apr. 28, 1932: From WFP. To FLW (Frank Lloyd Wright). "I am very disappointed not to have received your MS. before this... I plan to publish the book under my own personal imprint as originally intended. I have entirely withdrawn from Holborn House... The jacket design and the sample book arrived this morning. I will have �Holborn House� taken off the drawing..." Signed by William Farquhar Payson. May 4, 1932: From KEJ. To WFP. "...would you kindly return the jacket design sent you? Mr. Wright sent this design to receive your approval. The change of the name �Holborn� would be made here in the office..."
May 9, 1932: From WFP. To FLW. "...for your information. I have received from Holborn House a bill of sale for your book and others which I took with me to that corporation... I returned the jacket drawing to you, last week, as you requested, and I am hoping to receive all the material at the earliest possible moment." Signed by William Farquhar Payson. May 11, 1932: From KEJ. To WFP. "...Manuscript is almost ready... received the cover but need your instructions for the exact wording of your imprint..."
May 18, 1932: From WFP. To KEJ. "...my imprint: William Farquhar Payson... I am so glad that Mr. Wright�s manuscript will be here in the immediate future." Signed by William Farquhar Payson. May 25, 1932: From KEJ. To WFP. "Herewith the finally considered and corrected manuscript. I don�t know how you are situated now but hope we may be able to have the proofs here soon... I believe the psychological moment is here..."
Jun. 1, 1932: From WFP. To Mr. Wright. "Mr. Payson has asked me to let you know that the revised jacket and manuscript are here, but not the photographs... cannot move without the illustrated material..." Signed by Edith Day Robinson. Jun. 1, 1932: From KEJ. To WFP. "Herewith two additional photographs to be used... Mr. Wright thinks that in case you wish to use a portrait of himself in the book he would prefer it would be one of those made by Steichen..."
Jun. 4, 1932: From Edith Day Robinson (EDR). To KEJ. "Mr. Payson is quite disturbed because the picture material forwarded by you does not include the photographs Mr. Wright took away with him... They were two photographs of the city, one of a woman sowing seed by hand, and another one of a rural country scene. Four in all. ...if we do not get the material all in hand, immediately, we will not be able to get the book out according to schedule..." Signed by Edith Day Robinson. Jun. 15, 1932: From WFP. To Mr. Wright. "I am greatly distressed about the illustration... Where are the two skyscraper photos and the agricultural photo you showed me in New York? ...I need those three. ...I need the first ones and one more which can either be another agricultural scene or your photograph by Steichen. Do please rush four more photos to me..." Signed by William Farquhar Payson. Hand written in the margin: 1: "Smoke over N.Y." (Fairchild). 2: View from Empire State (Times Wide World). 3: "Harvest" by... 4: Portrait (from Colstow Leigh). Jun. 20, 1932: From KEJ. To WFP. Photographs will be rushed. Jun. 27, 1932: From WFP. To Mr. Wright. Now has photographs, but lacks three original from New York. Signed by William Farquhar Payson. Hand written: "On the way". Jun. 28, 1932: From EDR. To KEJ. "The two airplane prints you sent us about a month ago are so poor for reproduction that the engraver states it would be impossible to get sharp results from them..." requests clearer prints... Cannot proceed... Anxiously waiting... Signed by Edith Day Robinson. Jun. 30, 1932: From KEJ. To EDR. Photos are copies. Contact information for originals. Will work on getting new images. Jul. 11, 1932: From WFP. To Mr. Wright. Sending proofs and manuscript. "Please let me ask you to go just as easy as possible with corrections as the cost of author�s alterations is such a frightfully heavy tax, these days..." Signed by William Farquhar Payson. Jul. 11, 1932: From EDR. To Carl Jensen (KEJ). Please send brief bio, 250 words for jacket. Pictures and etcetera received. Jul. 14, 1932: From FLW. To WFP. "Here is the corrected MS. The corrections help clarify the ideas of I wouldn�t make them. And I suggest we include illustrations of the �House on the Mesa� and �The Middle Problem� mentioned in MS. On Page 32 instead of the two copies of foreign photographs and the picture of my fool self... I like the type and the set up and I am sure, all things considered, you will have a good and useful book." Jul. 19, 1932: From WFP. To FLW. Payson responds that engraving have already been made, so will stay with original plan. "I feel, too, that although the architectural photographs are intensely interesting it somehow limits the scope of the book if we use so few. Your text matter and the illustrations we have are so stimulating to the imagination in a broad way that it seems to me a mistake to get down to cases." Signed by William Farquhar Payson. Jul. 19, 1932: From KEJ. To EDR. Included sketch for cover and excerpts from critics for back flap of cover. Jul. 26, 1932: From KEJ. To EDR. Urgent request for the return of the negatives of "House on the Mesa". Jul. 28, 1932: From WFP. To KEJ. Returning photos and negatives. Aug. 26, 1932: From EDR. To KEJ. Request for former Governer Frank O. Lowsen�s address for complimentary copy and a note that a copy will also go to William Allen White. Aug. 30, 1932: From KEJ. To EDR. "...We find it very strange here that no copy of the book has come yet. We understand the book would appear on Sept. 8th and the author usually receives a copy a good many weeks in advance?" Sept. 2, 1932: From EDR. To KEJ. It was "delayed in production by the difficulty in getting pictures from Spring Green..." Request for a snap shot and material for a personal sketch. Sept. 8, 1932: From FLW and KEJ. To WFP and EDR. Enclosed snapshot and suggestion to use material from Wright�s Autobiography for the sketch. An offer to review the book for Midwestern papers or magazines. Request for 100 copies of the book. Sept. 12, 1932: From EDR. To KEJ. Snapshot was not included. Indicates that review from someone in author�s office would be rejected on east coast as "bias". Sept. 14, 1932: From FLW. To WFP. "I am quite proud of my publishers achievement. The little book is attractive - good style... Here�s hoping there is a sale for it equal to your expectations. Serious discussions of the �sore spot� - our landlord - is not going to be popular and this book is �tamped down� too much to be engaging reading - but - �God help the Poor� and their author and publisher... My best to you and congratulations." Sept. 19, 1932: From EDR. To KEJ. Scrap books and list of names arrived... "Most if the publicity on the book was done from three to four weeks before publication. It begins to filter through in print about a month after it is released. We are, however, wondering a little why the reviews do not begin to appear. There have been plenty of advance notes. Mr. Payson thinks perhaps they do not understand the format, hopes it is because they have turned it over to specialists to deal with. We had so many requests for review copies - every one of which, of course, met with attention - and the orders have also been coming through well in advance." Edith includes an example of one reviewer not knowing how to characterize Wright�s book. She continues to speculate that another reason may be the "unusual number of important novels coming out..."
Sept. 20, 1932: From WFP. To FLW. Appreciation for Wright�s letter of Sept. 14. Impatiently waiting for reviews. "Perhaps they�re sending it to specialists. If we get one big send-off it will help tremendously." Oct. 7, 1932: From EDR. To FLW. Encourages Wright to visit Chicago for an opportunity to broadcast an interview concerning "The Disappearing City". "The enclosed speaks for itself, from an individual, and most attractive person." Oct. 18, 1932: From EDR. To FLW. Requests clarity on whether Wright is willing to travel to Chicago seeing that it is to expensive to make a "hook-up from Spring-Green. ...I understand from your letter that your literary agent in New York has nothing to say about radio broadcasting." Nov. 23, 1932: From EDR. To KEJ. Requests letter from Soviet government and reply. A full page in the Boston Evening Post. Nov. 26, 1932: From KEJ. To EDR. Enclosed Wright�s statement to the office of Pravda. Would love to borrow clippings. Dec. 1, 1932: From EDR. To KEJ. Response to Pravda correspondence. Reluctance to send clipping to Wright�s office. "...when it comes to getting things out of the Taliesin office, my experience hasn�t led me to a 100% faith in either the promptitude or completeness on which I may rely! You may not believe it, but I haven�t asked for a single thing that hasn�t either had to be supplemented at this end, because part was missing; or it�s been a tug to get it because it had gone somewhere else..." However, she would see what she could do. Mar. 1, 1933: From KEJ. To WFP. Request for a statement of the number of copies sold. Apr. 5, 1933: From WFP. Statement of account 9/8/32 to 4/1/33. Copies sold: 566. Royalty earned: $140.80. Author�s Alterations: $43.05. Advance: $500, credit to author $97.75 ($140.80 43.05). Unearned balance: $402.25. May 6, 1933: From EDR. To KEJ. Sending clippings. May 18, 1933: From KEJ. To EDR. Appreciate seeing the clipping. Jun. 6, 1933: From EDR. To KEJ. Enclosing additional duplicates and clippings. Mar. 20, 1934: From FLW. To WFP. "I wonder if it would be helpful to you if we took over �The Disappearing City�. We intend to do a little printing ourselves and it you don�t want much to sign off to me we might find enough. By the prospectus herewith you can see what we are up to. Kindly let me know it and how much right away." Mar. 27, 1934: From WFP. To FLW. "Have on hand 183 bound copies - 1000 sewed sheets - 1000 jackets - full set electros cuts - bindings - dyes - will let lot go for $700.00 cash and cancel contract - can bind these sheets for $170.00 additional. Kindly advise quickly as may want to remainder these books in immediate future." (Undated:) From FLW. To WFP. "Keep 83 copies, cancel Morrow bill, send one hundred copies bound and one thousand sewed, one thousand jackets, full set electros cuts binding dies and sign over all rights to me, will pay six hundred fifty cash collect on deliver." (Undated:) From WFP. To FLW. Western Union: Accept offer. "On receipt of payment will immediately cancel morrow bill. Will return contract to you cancelled - Will assign copyright to you and all other rights in the Disappearing City." Apr. 3, 1934: Packing slip (case 2): 308 - The Disappearing City, Sewed books. 100 - Bound books. 1240 Jackets. Full sets of electos halftones, binding dies. Apr. 24, 1934: From KEJ. To WFP. "When we wired you to accept the terms... we did so under pressure of an offer from a gentleman who urged us to take it on and offered to supply the money. But we learned to our chagrin when the book arrived that the gentleman, Goldsmith by name, could have been more appropriately named. He failed to produce the money..." Wright apologizes and is contacting others for help. Because the terms were C.O.D., the crates sat at the station and were "piling up demurrage charges at an alarming rate". Wright agrees to sign a note for sixty to ninety days if Payson will release the books. Apr. 28, 1934: From WFP. To FLW. "...Unfortunately, I cannot release the shipment to you as I am not privileged to do so. These items are basically controlled by my printers and binders under a working agreement I have with them which assures me of the necessary credit to carry on my business in these difficult times. It was only because of my representation to my printers and binders that I had received a cash offer from you of $650. that I was able to make the shipment and take the plates, etc., etc., out of their hands..."
(Undated): From FLW. To WFP. Wright telegrams Payson that he will be forces to return the books immediately unless he can persuade the "timid printers" to release the books for sixty days pending outcome of negotiations. He will not "touch books unless deal goes through..." The "extended storage charges are prohibitive." May 10, 1934: From WFP. To FLW. Western Union: Payson agrees to release shipment for a 60 day note for $650 dated May 15, 1934. May 10, 1934: From FLW. To WFP. Wright encloses note. May 14, 1934: From WFP. To FLW. Payson receives note and agrees to release shipment. Copy of note is attached. July 17, 1934: From FLW. To WFP. Wright does not pay off the note, but sends a second note. "Enclosed is 60 day note to replace the first one given. We are doing our best to realize enough by book and hook or crook to �pay up�. Pray for us." Copy of note dated July 15, 1934, due September 15th. July 26, 1934: From WFP. To FLW. Payson returns note. "The note which you have given me in the sum of $650. and which was presented for payment, and dishonored, cannot be renewed..." Note was transferred to American Book Bindery, Inc.
August 2, 1934: From the Law offices of Weiman, Quinn, Allan & Spett, New York. To FLW. Law office representing American Bookbindery, Inc. "...unless payment... is made by return mail, we are to institute proceedings against you..." They gave Wright until August 7th, 1934.